"Oh Dakota!" 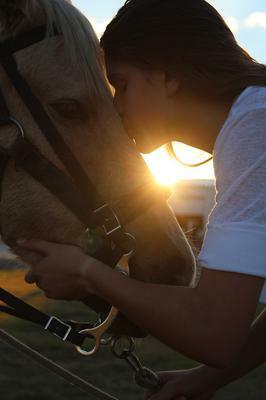 Jessica Miers whispered throwing her arms around her favorite lesson horse's fuzzy bay neck. "I'm so tired of Julianna!" she said quietly into his ear. "She signed up to ride you in the show Saturday!" She sobbed putting her face in his tangled black mane. "I've waited all year to ride you in the show and now I won't. The only other horses left are Cisco, Patches and Jolly! Why can't she ride Jolly? You're too experienced for her anyway." Jess sniffed and clucked as she walked slowly up the hill. Dakota followed, no halter needed. She got up to the barn and walked beside Dakota into his stall. She closed the door and began grooming him for her riding lesson. Julianna, a girl around Jess's age stood grooming a little grey pony named Jolly. Jess finished grooming and tacking up and started to lead Dakota out to the arena when she heard her trainer's voice. "Julianna, Dakota is a bit too green for you right now. How would you like to ride Jolly in the show?" Jess sat down on her bed and stared at the picture of Dakota on her wall. He stood out in the snow with his red blanket on his bay coat grown out for winter. Jess smiled and lay back into her pillows thinking about her lesson. Julianna was reassigned to ride Jolly and Jess was riding Dakota. She had an amazing ride too. She and Dakota had jumped their highest 2-foot jump at the canter. She had spent about an hour afterwards grooming him and talking to him while she hand grazed. Her eyes once again rested on the picture of Dakota. What would she do if he ever got taken away from her? He was her best friend, her soulmate, her partner, her whole life. She told him everything. All her secrets and dreams, passions and loves. He was the best thing that ever happened to her. "Dakota?" The voice of a young girl called out in the early morning darkness. A horse's soft whinny came in response. "Dakota where are you?" The girl asked as she walked along the wooded path looking for her horse. Seconds later, a stocky chestnut quarter horse stepped from the thicket, his mane blowing slightly in the soft breeze. "How did you get out again?" The girl asked her horse throwing her arms around his sturdy neck. He responded with a nuzzle to her shoulder. She smiled and lovingly pushed his head away. "Lets go home before Mom sees I'm gone," she said and hoisted herself onto the chestnut's strong back. She squeezed him into a steady walk knowing he knew the way home. A few moments later, the small barn came into view. She slid off of her horse's back and started towards the pasture, Dakota following. "Now stay in here this time, I'll be back out in a couple hours to feed you," she said and kissed her horse's soft muzzle. Quickly, she hurried towards the house glancing at her watch. It read 5:32 A.M. "Great. Mom is probably up," she grumbled and quietly opened the back door. The sound of voices stopped her in her tracks. "He's getting too expensive. I don't know how we're going to tell her but we have to sell that horse. He's getting too expensive. Her Dad's voice rang in her ears sending waves of terror through her mind. Quickly after she heard her Dad leave the house for work, she raced into her room to make it look like she was in bed. They couldn't sell Dakota. She wouldn't let them sell her beloved horse. Please write more! I really like your story! I want to find out what else happens! Keep up the good work!! This is so cool! I need a part 3!